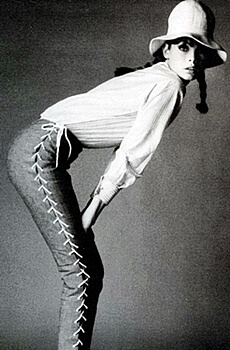 1960s Fashion Pants what’s old is new. Many of these 1960s fashions could be worn today. Capri pants are popular again! It cannot be repeated enough. Pants were worn for only the most casual activity. And never ever worn to school. They were not prevalent in the work place yet either. The pair of long pants pictured here were considered capri length, which tended to be longer than the capri pants of modern times. At right, note that the short shorts are covered by a skirt. Again, a lady doesn’t show too much leg! Culottes were another staple of 1960s fashions. They came as dresses, shorts, skirts. These were not allowed at school but if they looked enough like a skirt then you usually got away with it. The “coolie” hat was popular in catalogs but I never saw anyone wearing one. At last the swinging sixties found its groove. 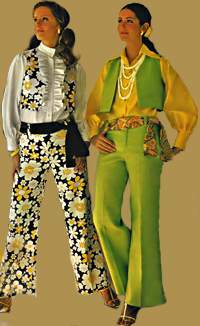 Everything including pants got groovy in the late 1960s. Bell bottoms, hip huggers, and yes, finally, you could see a navel. Teens embraced the new styles. (See also Teen clothes) Even mainstream women were sporting wider legs and lower waistlines. However, women wore dresses far more often than pants, which were still considered casual clothing. 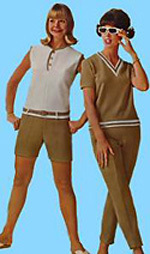 The outfit at right retains the feminine touch in the blouse, while the pants scream Sixties. And what fun are these two pieces. You can buy the dress alone or the dress with the pants. Paisley emsemble with a dashing romantic look. Button front dress has a shapely Edwardian collar, long slim sleeves, 3″ hem. Tapered bell bottom pants have a back zipper. Both crisp cotton canvas cloth. Flower power! Flowers fabrics abounded. At left, a traditionally cut pair of slacks made, well, louder, but an abundance of flowers. Note the wide collar. It’s a late 1960s style. The pair at right reflects the fascination with the bolero jacket and the gaucho look. Again, notice the softness of the blouses and the bell bottom pants. Bolero sets Sashed wide leg pants plus a wisp of a bolero. This pant set demonstrates ways in which the average woman might update her wardrobe without going too mod. The jeans are pure flower power, while maintaining traditional styling. The shirt has the wide collar but soft lines. These are hip. This pants dress with boots could have come straight out of a London boutique. The two piece at right has the loud color and pattern associated with the late 1960s. And lawdy, a navel. Eat your heart out Brittany Spears. But let’s get serious. Scanned from an ad for Diet Imperial Margarine. Really! They were called hostess pajamas or culottes. Considered the ideal outfit for entertaining, they were usually loose, flowing, gown type outfits. Here you have two huge stars from the 1950’s and 1960’s. Both Mary Tyler Moore (left) and Audrey Hepburn (right) are wearing what were called ‘cigarette pants’. They were stretchy, tight and very popular. Black seemed to be the favorite color but they could be purchased in an array of solid colors. Last but not least is the blue jean. It gained popularity in the 1960s specially with young people. If you were an adult you probably only wore jeans if you were going to an outdoor event where you might get messy or soiled. If you were under 20 you wore them all of the time (except at school). Shown here is another popular screen star Grace Kelly who later married the Prince of Monaco and became Princess of Monaco.